Harold Pinter (1930 – 2008) is the man I know from his auctorial descriptive Pinteresque, his connection to the Theatre of the Absurd and his screenplay work on other writers’ novels, such as The Servant (1963), The Go-Between (1970), The French Lieutenant’s Woman (1980), and especially The Comfort of Strangers (1990), one of the more devastating film experiences of the eighties. Outside of theatre, Pinter’s most popular lemma is the title of his play The Birthday Party, which survives to this day as Nick Cave‘s band The Birthday Party. Harold Pinter is a defining playwright of the 1962-coined Theatre of the Absurd theatrical movement along with French Eugène Ionesco, British Samuel Beckett, French Jean Genet, and Russian Arthur Adamov. The movement’s avant-la-lettre predecessors include Alfred Jarry, Luigi Pirandello, Stanislaw Ignacy Witkiewicz, Guillaume Apollinaire, and the Surrealists. Other playwrights associated are Tom Stoppard, Friedrich Dürrenmatt, Fernando Arrabal and Edward Albee. I don’t know what to think of Pinteresque. I feel as if Pinter and Buñuel share a set of the same sensibilities but I wonder. If one does a Celebrity Deathmatch between Pinteresque and Buñuelian, Pinter wins with 19000+ vs 6000+ for Bunuel. Which is a pity, because I find Buñuelian absurdism a fuller experience than the Pinteresque, Buñuel manages to add spiritualism, humor and sensuality to his work whereas Pinter seems to bog down in kitchen-sink-naturalism. But Pinteresque is clearly the winner here, with Wikipedia defining Pinteresque in their separate article characteristics of Harold Pinter’s work and clearly no Buñuelian counterpart. Another interesting aspect of Pinter’s work is his use of pauses, typographically represented by ellipses. Pinter uses it to such an extent that it has gained fame as the “Pinter pause“, a theatrical technique used for example to great effect in the water dripping faucet seduction scene in The Servant (1963). DAVIES. But it’d be a matter … wouldn’t it … it’d be a matter of a broom … isn’t it? Still, I prefer my ellipses by Céline (although he shares Pinter’s pessimism), who famously used them in Death on the Installment Plan in 1936, and which then became his trademark style, giving innovative, chaotic, and antiheroic visions of human suffering. In Death on the Installment Plan, he extensively uses ellipses scattered all throughout the text to enhance the rhythm and to emphasise the style of speech. This entry was posted in 1001 things to do before you die, absurd, experimental, fiction, grotesque, irrationalism, Luis Buñuel, modernism, theory, transgression, verisimilitude on December 25, 2008 by jahsonic. Claude Nicolas Ledoux has the best public domain eye. The best in the non-public domain area is the eye from Bunuel’s An Andalusian Dog. French blog Au carrefour étrange has a post on ocular eroticism. I love books or films which start with the sexual life of…. 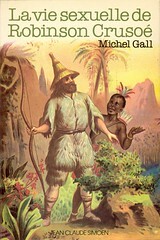 Examples in this category include The Sexual Life of Catherine M., The Sexual life of the Belgians, The Sexual Life of the Savages and now this The Sexual life of Robinson Crusoe. Emmanuel Pierrat has called The Sexual life of Robinson Crusoe a small masterpiece. It is not available in an English translation. Here the An Andalusian Dog eye, just before being slashed, with the beautiful Argentinian tango in the background. Here is the tango scene with a nice colorized pre-razor still of the film. This entry was posted in 1001 things to do before you die, art, eroticism, film, Luis Buñuel, world cinema classics on October 21, 2008 by jahsonic.